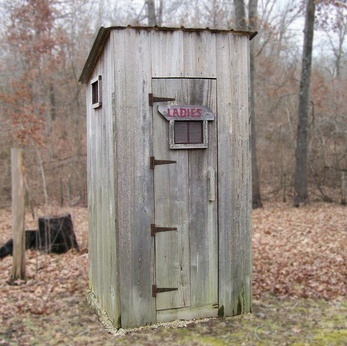 The outhouse was the original toilet. A toilet can increase both the practicality and aesthetic quality of your bathroom. Increasing demand for unique designs has spurred a set of radical toilet designs to match the consumers' diverse tastes. The functionality of toilet designs is still the most important concept, and this practical focus coupled with design features has created three main categories of toilet classification. A relatively inexpensive type of toilet design, the two piece toilet, gets its name from the bowl and base standard design. The common elements in a two piece toilet are separate water basin and a bowl piece. The water basin (tank) is mounted on top of the bowl. Styles within this type of toilet range from elongated bowls to round bowls and corner-fitted basins. The main flaw in the two piece design is the areas in which dirt and grime can become trapped, making this toilet more difficult to clean. Often appreciated for its ease in cleaning, the single fashion toilet increases functionality. This design gets its name from the one piece fixture. With a single fashion toilet, the bowl and basin are one solid piece. As with the two piece, styles within this category include elongated and round bowls and corner-fitted basins. The most significant difference is the seamless design and the lack of crevices between the bowl and basin. This toilet design can easy be double the price of a two piece model. For a more modern design, the wall-mounted toilet adds both functionality and a deco design element to the bathroom. The standard body design is a single piece that is mounted to the wall rather than bolted directly to the floor. This style eliminates more issues than the single fashion when it comes to cleaning the toilet and adds enhanced elegance to the room. As with the single fashion and two piece designs, the wall-mounted toilets offer a similar range of style options. This design is the most expensive of the three types but offers an additional feature: with the wall-mounted design, during installation you can adjust the height of the toilet to meet your specific comfort needs. The flushing action of the toilet can also vary to meet individual users' needs. As with the separate types of toilets, there are three types of flushing actions to choose from. The most common type is the gravity flush. This design uses the weight of the water to push waste through an S-shaped canal and down the pipe. A pressure assisted toilet utilizes a mechanized pump to increase pressure and pull the waste through a straight pipe, reducing the risk of clogging. Vacuum assisted toilets work similar to gravity flush, but they rely on a vacuum of pressure rather than the weight of the water to pull waste through the drain. A final type of toilet available is the composting toilet. These come in a few different styles and use dehydration and heat to compost the waste, which is then either manually removed for use in gardens or automatically flushed to a compost area.